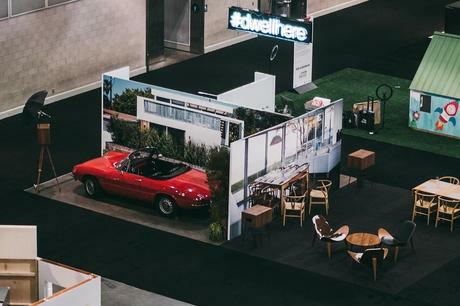 Here at Dwell on Design LA, we’ll be giving visitors an in-depth look at the platform where they can sign up and explore four specially crafted photo booth vignettes that we’ve created from landscapes and rooms we’ve featured in the magazine. With the help of a number of our partners, we’ve formed an integrated experience that’s like stepping into the pages of the magazine. We’ll be personally walking you through the new platform and showing you how you can become part of the conversation. Once you weave your way through the booth—made up of a combined dining room/lounge furnished by Carl Hansen & Søn and carpet tiles from FLOR, a children’s bedroom featuring a collapsible wall system bunk bed from Resource Furniture, and a bathroom holding a freestanding bathtub from TOTO—you’ll find yourself in an outdoor space boasting a bright red 1966 Alfa Romeo Duetto Spider provided by the Petrolicious Marketplace. After you pose for a picture in front of your favorite Dwell photo with iPad selfie stations provided by Petite Pix, our team will personally help you get set up on the new Dwell. We’ll then print out your picture on Petite Pix printing and social media stations, which can then be used as your profile picture on the new platform.